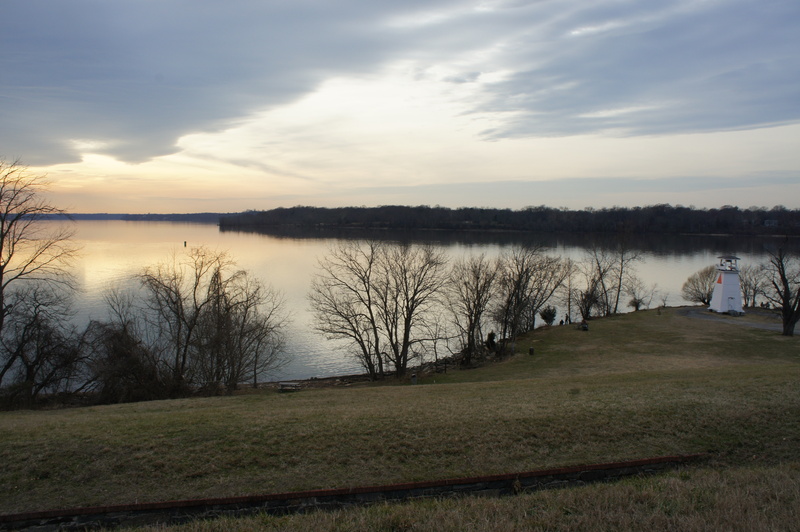 Fort Washington Park is a 30-45 minute drive from Washington, DC and is often visited in conjunction with nearby Fort Foote, Harmony Hall, and Piscataway Park. 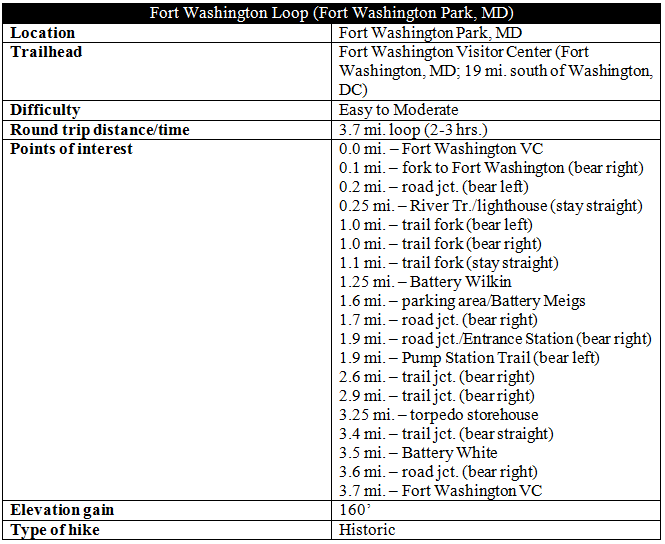 Begin your visit at the Fort Washington Visitor Center, which offers historical and recreation information on the park and serves as the start and end point for this loop hike. The walk from the parking area, which passes between Battery Decatur and an observation tower, is roughly 150 yards. Once you’re ready to hike, head south on the paved path from the overlook and bear right as the path weaves downhill into a grassy gully. Detour left at the next fork to explore the main fort or continue right to head toward the river and the start of the loop portion of the walk. 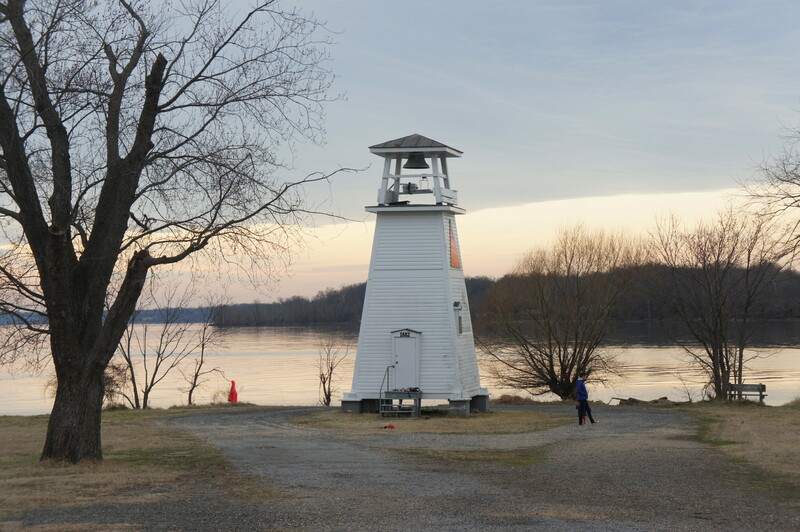 At 2/10 mile, bear left on a partly graveled path; Light 80—a small, white lighthouse—is visible ahead. As the trail approaches the lighthouse, five different routes converge at a sunny junction. Look for a sign to your left reading “River Trail”—follow this path as it skirts the base of Battery White. 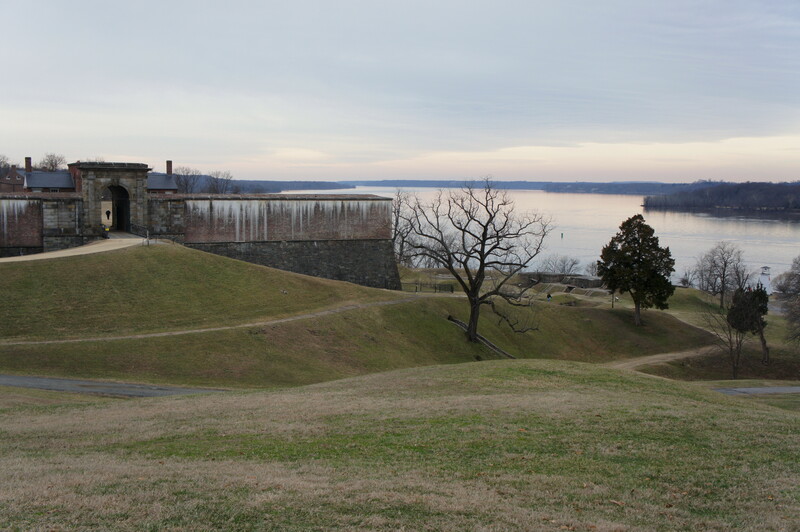 The River Trail quickly enters woods and follows a narrow strip of land between the Potomac on the right and the fort walls on the left. As the fort disappears from view, the trail follows an old road that bends eastward and abruptly ends at a wooden boardwalk at around 6/10 mile. Continue onto the brief boardwalk, then follow the singletrack trail as it cuts across a woody ravine and, at 9/10 mile, passes a rifle trench on the right. 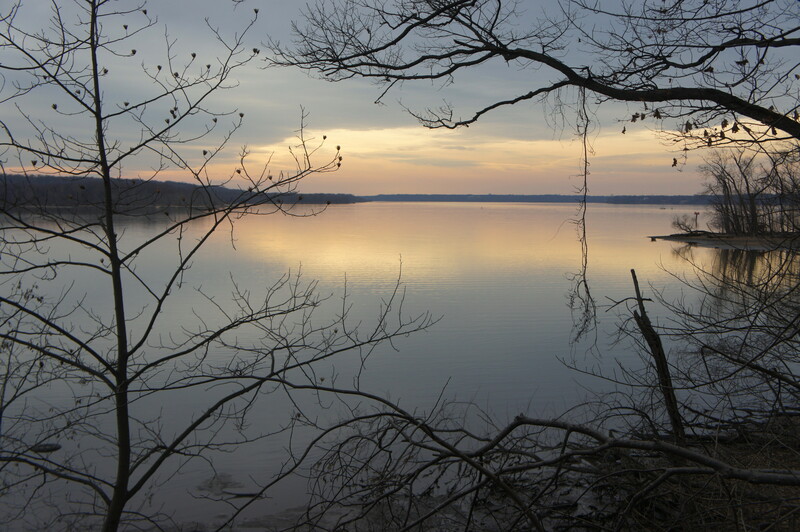 Views of Piscataway Creek, a significant tributary of the Potomac, are plentiful. From the rifle trench, the River Trail begins the first of two significant climbs. Stay left at the junction, then ascend a set of wooden steps to clear a modest bluff. Stay right at the next fork, then descend sharply into another gully. Cross over a muddy stream, approaching another junction—stay straight this time. 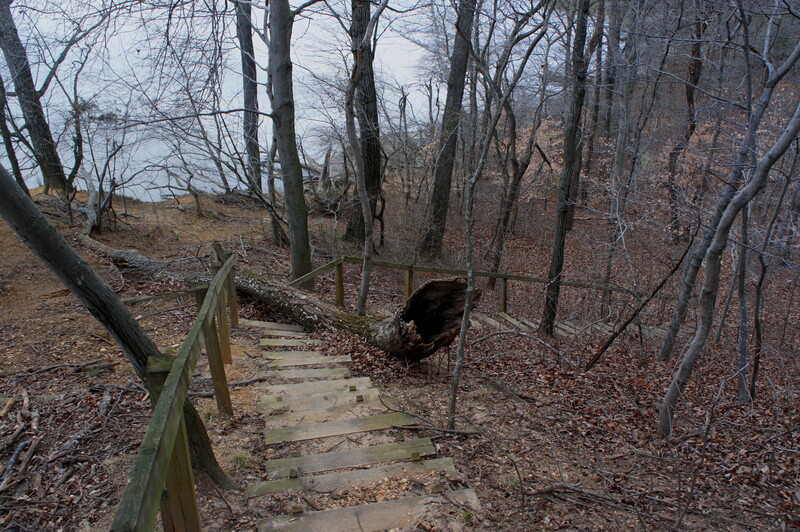 Climb a steep and lengthy set of stairs and enjoy the partly-obscured view of the Potomac from atop the ridgeline. With the hardest climbs behind you, the trail bears northeast and ascends gradually to Battery Wilkin at 1 ¼ miles. 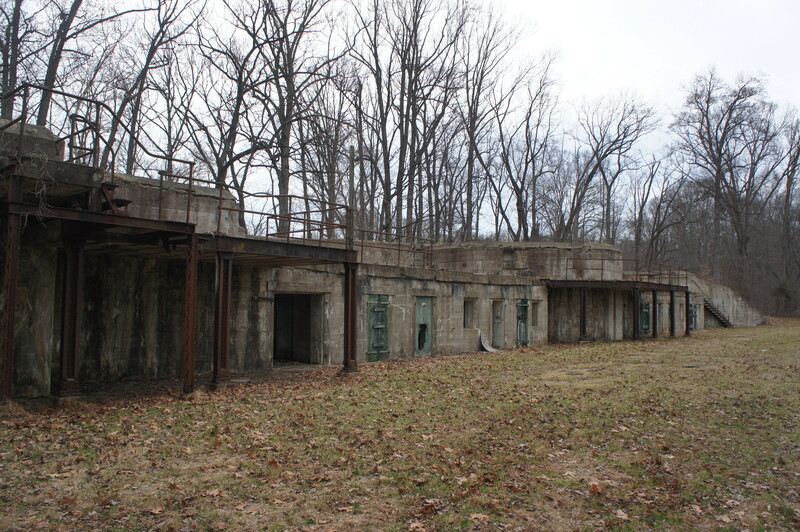 This battery, now rusted and overgrown, was constructed at the turn of the 20th century and remained in service until 1928. From here it is a short walk to Fort Washington Road and the Entrance Station, off to the right. Pass the entrance and cross the road, immediately turning onto an old, overgrown road marked with light blue blazes. This is the Pump Station Trail. The Pump Station Trail starts as a straightforward walk on a gravel road, following a deep ravine on the left. As the old road gives way to a narrow footpath, however, the trail becomes difficult to follow. As a general rule of thumb, stay close to the metal fence on the right (on the other side is a golf course), then keep a close eye out for blue blazes as the route bends and bears west. Around 2.5 miles, having skirted a sloping hillside on the left, the faint path crosses a minor creek; around 30 yards farther, the trail splits. Bear right. 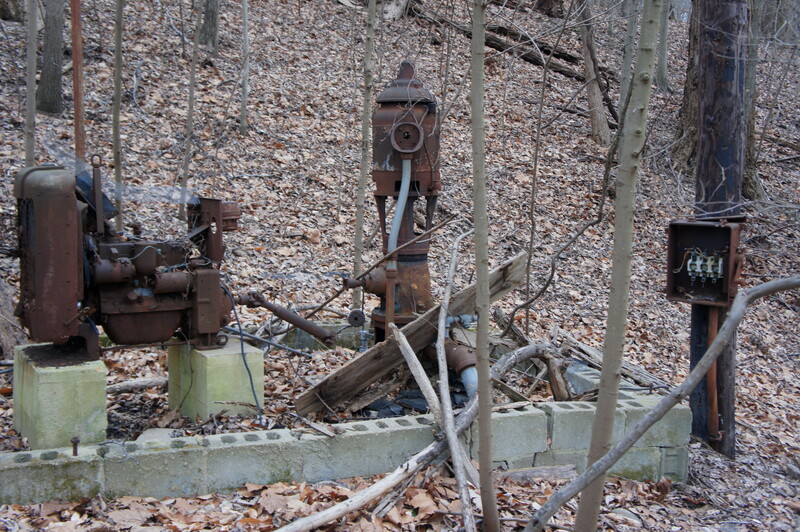 After 1/10 mile, the trail passes an unidentified, old rusted contraption on the left; a couple minutes later, upon reaching a fenced-off building on the left, take a minor detour to the right to the banks of Swan Creek, which feeds into the Potomac just downstream. 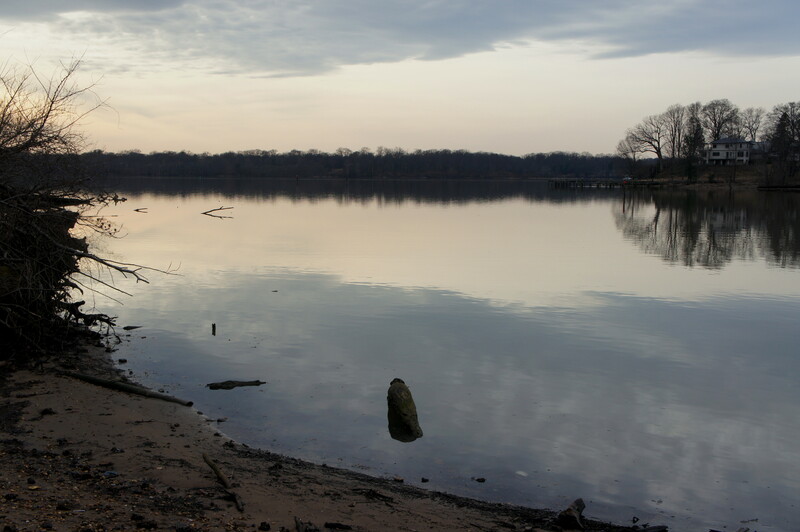 At 2.9 miles, bear right on an easy-to-miss trail, marked by a small blue stake that reads “0.5.” This is the start of the Waterside Trail, which, fortunately, is easy to follow as it hugs the shore of the Potomac River. 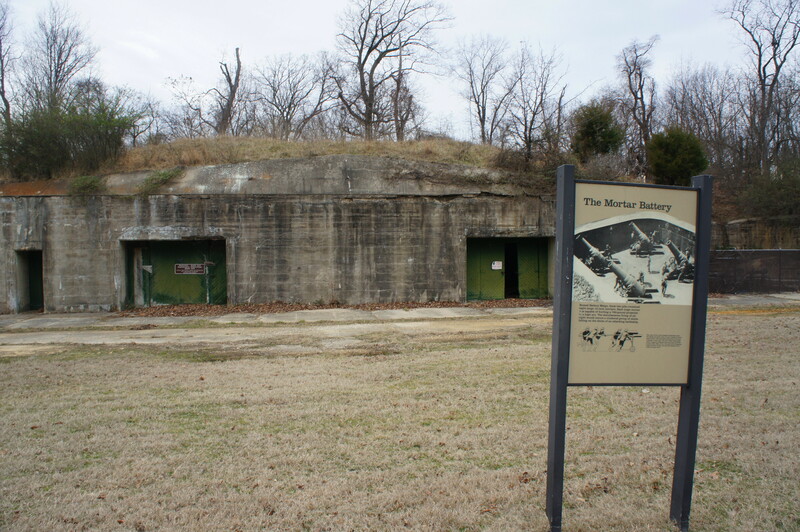 At 3.25 miles, the trail passes the old torpedo storehouse, a former storage facility for explosive mine parts (not quite sophisticated “torpedo” we think of today). Stay straight on the now-wide double-track; there is a parking area visible uphill to the left. 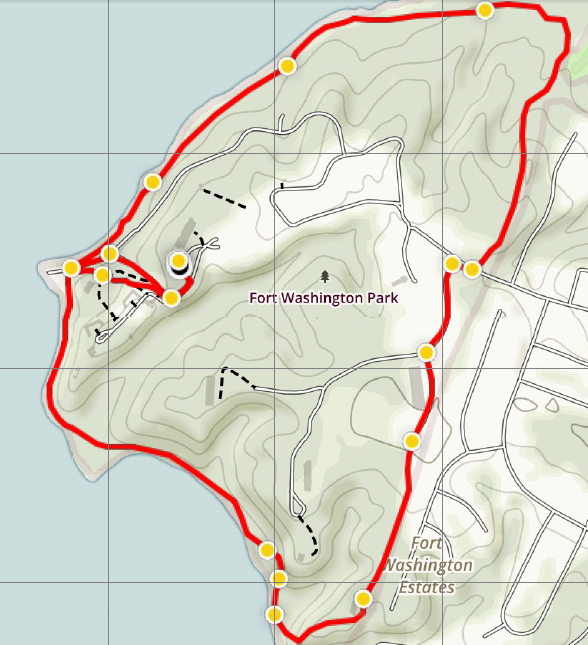 Roughly 3.4 miles from the start, hikers will be back at the five-way junction between the lighthouse and Battery White. From here you have a couple choices. The first is to return the way you came a couple hours prior—ascending the paved track back to the Visitor Center. 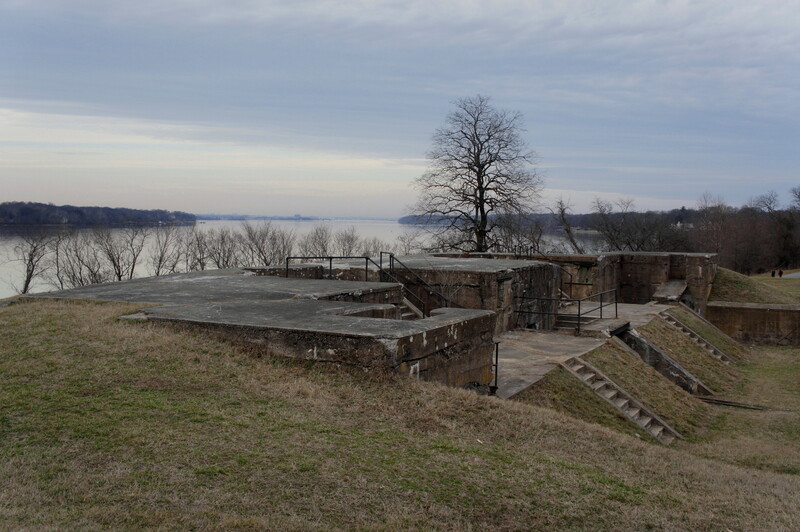 The second is to follow a smaller footpath that skirts the side of a hill below Fort Washington and provides close access to Battery White. 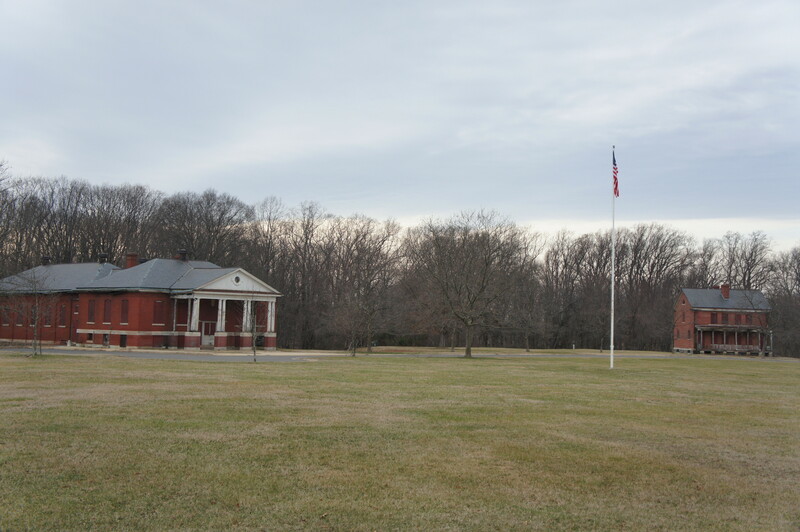 Both options end near the fort entrance, a short jaunt from the Visitor Center. Allot 2-3 hours for this 3.7-mile loop. Spring through fall, be sure to wear long pants and bug spray to avoid ticks, as parts of the hike pass through tall grass. 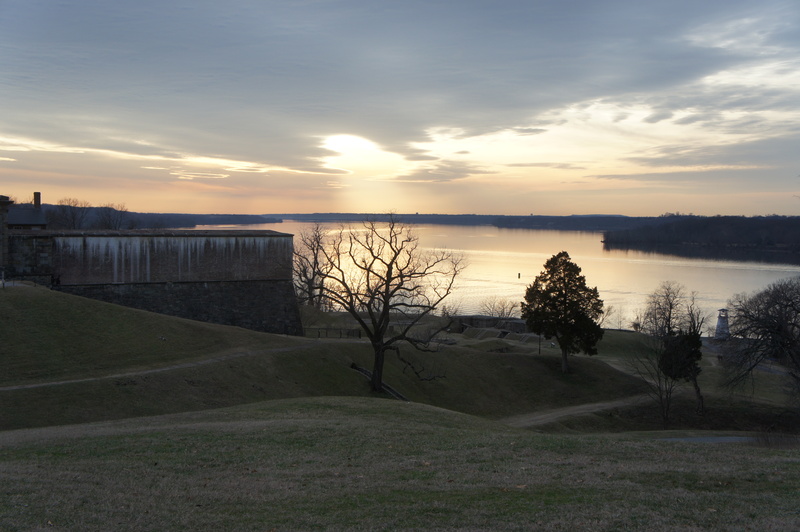 Explore the grounds of Fort Washington, or visit the old Civil War-era structure at Fort Foote, a 7-mile drive north of Fort Washington. This entry was posted in Civil War, Fort Washington Park, Maryland and tagged Battery Meigs, Battery White, Battery Wilkin, Civil War, Civil War Defenses of Washington, Fort Washington, Fort Washington Loop, historic, lighthouse, loop hike, Maryland, Piscataway Creek, Potomac River, Pump Station Trail, River Trail, Swan Creek, Waterside Trail. Bookmark the permalink.